We decided that our family needed a little vacation to unwind and have fun so we went to the Dells. 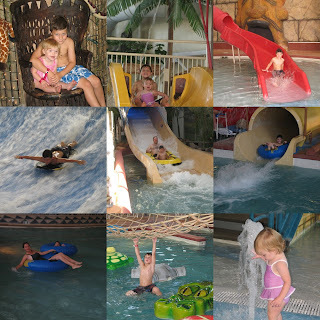 We stayed at the Kalahari resort where they claim to have the largest indoor water park and we weren't disappointed. There were fun things to do for every age group and we all had a blast! Jake is the perfect height to go on just about everything and many of them by himself. There were a few kiddie areas for Olivia to play and have fun where the water wasn't very deep. We spent two days in the water park and one night in a royal two room family suite (that they upgraded for us with no extra charge) and since the Dells are a three hour drive from us, we were pretty tired when we got home. We all had fun and we'd definitely go again! That was our favorite vacationing spot.... I'm so jealous!!!! How fun!!!! It looks like you guys had so much fun! We took our kids to a water park here this summer and had a lot of fun too. Its nice when they are tall enough to enjoy it more. Then its more fun for the grown ups too!